I guess we also have to consider the 4Der's hands. What will they need to be like in a 4D world? wendy wrote: The difference between a 3d driver and a 4d driver, is that the up direction is part of the wheel in 3d, but in 4d, the 'up' direction is not one steers to. Turning a steering wheel in 4d does not make the car go upwards. In 4d, a wheel is still a fat circle, but the steering device is a disk (ie a N-1 sphere that one might grip). Let's call it a steering-disk to remind us that it is not a fat circle. Cool, thanks Wendy. I feel we are kosher on this! :-) We can only use our 'up' space, in place of the 4th axis, to approximate what occurs in 4D; but it still helps conceptually. Klitzing wrote: The 4D steering wheel is not at all complicated and unusual. They would have 4 directions to drive away from straight on, just as we have only 2 directions within our driving contexts within 3D. Thus our cars use a real steering wheel (using its tangential directions) to drive on streets. But aeroplanes also have 4 sideward directions: right, left, up, and down. They do use a joy stick for steering wheel. Either direction serves for any of the directions of deviation. And undeflected it will guide straight ahead. Thus, cars of 4D world most probably would just use a joy stick as well. Quite so. And such a steering joystick in 4D could be connected to a joint in the shape of a spherinder (extruded sphere), that allows rotation in 3 planes (or any in-between combination thereof). Of more interest is how roads would be laid out. I don't remember if it was this topic or another one on this forum, where we discussed the generalization of lane markers painted on the road surface. The most obvious generalization would be to paint the 2D boundaries of each lane to indicate the subdivisions in the road (or some checkered pattern thereof, just like we paint lane dividers as dotted lines). However, this requires a lot of paint. It would be much more economical to paint a single line in the middle of each lane, so that drivers will try to keep their vehicle centered on that line, instead of steering between lines or within a 2D boundary of the lane. Both are functionally equivalent, but this approach saves a lot of paint. Hi quickfur. It is certainly thinking outside the box which is what we need to do (well, even literally I guess because a box is only part of a tesseract). Can you imagine if we used the same principle in our world: lines to follow rather than lane dividers? The challenge is what happens when the two vehicles stray and scrape. Who gets to claim that the other was invading their space? gonegahgah wrote: Hi quickfur. It is certainly thinking outside the box which is what we need to do (well, even literally I guess because a box is only part of a tesseract). True. So the question becomes, is the amount of saved paint worth the trouble caused by it being more difficult to tell who's at fault? Also, the higher the dimension, the greater the cost of the paint, so at what dimension does the cost of paint become high enough to outweigh the ability to judge between scraping cases? A bit of paint can be saved by painting in cage pattern instead of full dividers. They could start with the corners of the hexagon to delineate the lanes then add in a few inter-extra lines along the edges of the hexagon dividers. They would probably just need enough lines so that lane changing must involve intersecting those lines with some part of the vehicle. That would possibly work and reduce the amount of paint necessary? gonegahgah wrote: A bit of paint can be saved by painting in cage pattern instead of full dividers. I thought about that, in fact. If lane dividers are painted as the edges of a 2D tessellation, like a hexagonal tiling, or even a boring ole square tiling (or maybe a diamond tiling / rotated square tiling), then it still gives enough of an outline of the 2D area, without requiring that you paint over the entire 2D area. So this seems to be an acceptable solution as well. You could even say that dotted lines in 3D are a kind of analogue of this, too, if you regard them as apeirogons where (elongated) ridges are painted and the inside of the cells (edges) are blank. Kindof. Haha, I was just about to mention it when you showed up. That is a good idea too. Does the monorail approach allow for easy lane changing? Actually there are 2 rails so it is not monorail but they are 2 parallel planes, hence planar rail. And yes, lane changing is the idea - You steer left or right on the plane to select your lane, just like you do in 3D. Whereas for actual curves in the road, the plane banks for them so you would steer straight ahead. So the only time you ever need to steer, is in order to change lane. Keiji wrote: Actually there are 2 rails so it is not monorail but they are 2 parallel planes, hence planar rail. Y'know, when you put it that way, it seems a lot more attractive than the other options. Just think of how many accidents could be avoided IRL if cars only needed to be steered when switching lanes / turning to a cross road. You wouldn't even have to steer for a cross road! Unless space was extremely limited that you couldn't build a banked turn. Keiji wrote: You wouldn't even have to steer for a cross road! Unless space was extremely limited that you couldn't build a banked turn. Well yes, the steering here means steer into the turning lane, which would automatically curve your path to merge into the cross road. I must admit I don't immediately understand how the planar rail works. I will have to examine it further. Any extra explanation you would consider throwing at me is much welcomed. Does the Planar rail wiki page help? Keiji wrote: Does the Planar rail wiki page help? It certainly is an interesting idea, though I do think that the navigational difficulty with the 360° of lateral directions is perhaps a bit overblown. After all, as a native 4Der, one would face the same difficulty while walking, which already makes it difficult to give directions -- what you consider to be left/right/reft/light may be very different to the person you're talking to, because they're oriented differently in the lateral plane. Furthermore, by making a slightly out-of-order sequence of turns will quickly put you into a different orientation than you might have expected: e.g., if we use an overhead view, and assign the north pole of the earth to be the forward direction as a reference, then turning to point at, say, Central America, then turning again to point at Saudi Arabia, then turning to face the south pole, will leave you in a 90° rotated orientation than if you had simply turned directly from north pole to south pole. This is for the case where we use clean 90° turns only (assuming turning from Central America to Saudi Arabia is approximately 90°, just a crude simplification here). In real-life, it's highly likely that one would accumulate small amounts of turns in the lateral plane, so by the time you walk down the winding garden path to the gate, your orientation could virtually be any random number from 0° to 360° in the lateral plane. Attempting to follow a directions as a series of turns after that will almost certainly get you completely lost. As such, it would seem that landmark navigation in 4D becomes much more important than in 3D, since the only reliable way to give directions is to specify a sequence of landmarks rather than a sequence of turns. Since this is the case, it would seem that most roads would be built with landmark navigation in mind (unless you're deliberately trying to confuse travellers! ), and so most people, having grown accustomed to this mode of navigation, would not have too much difficulty applying it to directing a vehicle. Having said that, though, the planar rail idea does sport a lot of advantages; so I'd say that probably people would adopt that method of road construction in urban centers where it is desirable to maximize navigability by directions (as a series of turns -- landmarks may not help in an area densely built with similar-looking buildings), safety (the fact that passenger doors are always out-of-plane with the road surface is a pretty big selling point, I think), and ease of driving (all you have to do is decide which lane you want to be in). Urban centers would also have the resources to build these rails. In rural areas, though, I'd expect people to use primarily landmark-based navigation, with rail-less dirt roads that require vehicles with "spaceship steering". In fact, this suggests that perhaps, in a hypothetical history of 4Der civilisation, spaceship-steering style roads would be developed first (as the most obvious development from walking on foot), and planar rails later, based on experience with the accident proneness and difficulty of navigation of the former. The advantages of planar rails would cause rapid adoption by all major urban centers, which would lead to trans-city highways also using planar rails. Rural villages would probably only have a single planar rail road passing through it, with parking areas by the side for local residents who own a vehicle, and travelling within the village would basically be done on foot, or by switching to a "spaceship steering" vehicle dedicated for local, short-distance travel. This would cause a differentiation between vehicle types, and eventually, planar rail roads would become an expected infrastructure in any sizable community, and most common folk would own a planar rail vehicle. Eventually only pioneers and explorers would own "spaceship-steering" vehicles for exploring the wilderness. Probably, this would entail a licensing system for "spaceship-steering" vehicles to ensure that drivers are able to drive it correctly and navigate properly. I wonder if the need for both planar rail vehicles, and spaceship-steering vehicles, will lead to bi-modal ones being developed? This is very interesting. I've only had a light read at the moment but it sounds cool. I'll have to study it more intently soon. What quickfur says about it being a later invention after roads being initially based upon walking movements sounds very plausible too. Good thinking. The idea is beginning to conceive as very excellent Keiji. Just as a consideration I am wondering if two tracks are sufficient for vehicles to remain upright; and not fall over sideways when the vehicles are stationary or moving. Of course we already have mono-rails in 3D; but they are big and require careful balancing. Generally our trains run on two tracks. If our trains tried to balance on a single track they would fall over sideways. Would trains in 4D on only two tracks likewise tend to fall over; even tracks at 180° to each other? Is it possible that we would need three tracks as a minimum (probably 120° to each other) to allow vehicles to remain upright while travelling; even on these excellent planar rails? Keiji wrote: I wonder if the need for both planar rail vehicles, and spaceship-steering vehicles, will lead to bi-modal ones being developed? I'd imagine there should be similar dual-mode vehicles for railroad tracks vs. normal roads too -- some track maintenance vehicles perhaps, so that you can drive on regular roads near a problem spot without interrupting other railway traffic, then get on the tracks and move to the actual problem spot which may not be accessible by road. gonegahgah wrote: The idea is beginning to conceive as very excellent Keiji. The vehicle doesn't need to be completely supported by the tracks. The tracks can just act as guide rails, constraining motion to a single lateral direction, but the vehicle itself can easily be supported by other wheels (outside the track) that rest on support surfaces beside/between the tracks. gonegahgah wrote: Of course we already have mono-rails in 3D; but they are big and require careful balancing. Actually, neither is necessary! Two parallel planar rails, with eight wheels on the vehicle, four on each rail, are sufficient to keep the vehicle stable. If you were using linear rails, like our 3D railways, then yes, you'd need a minimum of three rails for stability. However, since the rails are planar, you can imagine the shadow of the vehicle being "wedged" mostly between the two planes, attached to it by the wheels. Gravity then does the rest of the work, keeping the vehicle directly on top of its shadow. A further thought on this. In a 4D city, blocks would be laid out as cubes (it doesn't have to be, but suppose it does). Then the space between city blocks would be 2D corridors, and guess what would fit perfectly into this picture? Planar rails! Or, for that matter, consider the space between two adjacent buildings. It's a 2D area, where planar rails can be fitted. Now, probably, we don't want to have an arbitrarily long and wide planar rail, since that would be like driving in an unmarked parking lot in 3D, so you're going to be extremely accident-prone. So for the main traffic corridors in the city, you'd want to have the planar rails confined to a narrow strip (this also saves on the cost of materials for building the rails!). But the space between buildings would be a perfect place to have a wide 2D area that can serve as a parking lot or a passenger pickup/dropoff area. On either side of this "parking lot", there would be 2D pavements next to the buildings' walls where passengers / pedestrians can walk. Note that in spite of the similarity to having two sidewalks on either side of the road in 3D, in 4D it's possible to connect both sidewalks to each other without using any bridges or underground walkways, since you just need a flat cylinder joining the two pavements, which to the vehicles would just be a "island" they need to drive around. Since between every two buildings there's this 2D space available, it's easy to organize the city so that two rows of buildings are lined up to make a single long 2D strip of space for laying planar rails for the main roads. This 2D area can then be divided into many lanes to increase throughput. Taking this yet further, we can organize main roads into layers, the middle layers of which correspond with high-speed lanes for long-distance travel, and the side layers of which are used for slower traffic and drop-off points. 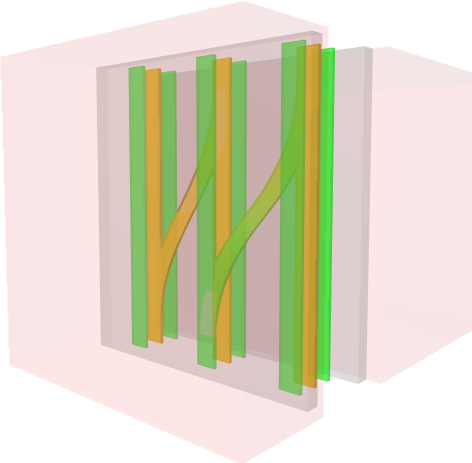 The middle layer would be divided into n well-separated strips (lanes), with occasional forks that curve sideways to merge into the slower side-lanes (using the extra space between lanes for this purpose), and other forks that allow switching to adjacent lanes within the same layer. Where there are no forks, the extra empty space between lanes can be used transversally as pedestrian crosswalks to pass from one side of the road to the other (without ever needing to step on the road surface!) of the overall 2D road area. This entire structure can be completely at ground-level, since the extra dimension on the ground allows us to implement this criss-crossing structure without ever needing to use overpasses or underpasses. Best of all, we only need extra space between buildings proportional to the number of layers, but within each layer, we can have a large number of lanes laid out parallel to the buildings' walls without running into the problem we have in 3D of buildings being spaced too closely together, thus preventing future road expansion. In 4D, this problem only happens after the number of lanes grow enough to exceed the width of the building, which is far larger than the space between buildings in 3D! Keiji wrote: Actually, neither is necessary! Two parallel planar rails, with eight wheels on the vehicle, four on each rail, are sufficient to keep the vehicle stable. Hi Keiji, I'm not so sure about that. If we put 8 wheels in-line on our trains (or any number) and send them along a single rail they are still likely to fall over sideways. Keiji wrote: If you were using linear rails, like our 3D railways, then yes, you'd need a minimum of three rails for stability. However, since the rails are planar, you can imagine the shadow of the vehicle being "wedged" mostly between the two planes, attached to it by the wheels. Gravity then does the rest of the work, keeping the vehicle directly on top of its shadow. Again, I'm not so sure about this yet. The planar rails I would have thought would allow complete freedom of movement in the 'yaw' (or 'pitch'?) of the rail? So, wouldn't the vehicle still be very wobbly and fall over sideways? Hi quickfur, I was also wondering if it could be possible to have the twin rails closer to each other rather than on opposite sides of the vehicle. Rails tend to imply - I would imagine - a fixed rail wheel seperation distance. Which, on our roads wouldn't suit us as we have cars with different size wheel axles and trucks/buses with bigger (and more) axles to support larger vehicles. So if we have fixed separation rails then if they are paired more off to one side rather than on opposite sides of the vehicle then the third (or more) line of wheels can still have longer or shorter axles? That does mean using more asphalt to allow for different size vehicles of course? I wonder if they would have trains on dedicated three line rails, as well as buses on two line rail/asphalt road hybrids. We might also want some mechanism for going off road? This is an overhead view of the city plan, so it doesn't represent the 4th dimension, just the "floor plan" of the city's road system. Well, a small segment of it anyway. The two big transparent blobs represent (the footprint of) two buildings. Originally I had them both as cubes, but that required putting the camera too far away from the area of interest (the road system), so I squashed the left building to a cuboid instead so that it would fit into the current viewpoint. The grey "plates" sandwiching the road system represent the pavement between the buildings' walls and the road. The yellow roads are the inner layer roads that aren't immediately adjacent to the pavement, so they are high-speed zones (express lanes, in American parlance). Even though there's actually plenty of space between the lanes where one could conceivably pick up / drop off passengers, this lies in the driving lateral dimension of the planar rails, so no doors will actually allow you to get off in that direction. As such, the yellow roads are basically for fast travel only. The green roads have one side directly adjacent to the pavement, and the pavement is conveniently located where the doors are placed, so this is where you'd park and pickup/drop off passengers. I also included two ramps (which took me like 3 hours to model in povray with intersecting bezier curves!!) to show how you can switch lanes. They aren't really "ramps" per se, since there is no elevation at all throughout, but it's a convenient term for referring to something analogous to our 3D ramps. There are two kinds of ramps: one kind, shown by the ramp connecting two yellow lanes, allow you to change lanes within the same road layer. I didn't show such an interconnect for the green lanes because the image is getting a bit cluttered, but the same concept applies to all layers. The other kind of ramp moves you between layers, as illustrated by the green-to-yellow interconnect on the right (in case it's not clear, it's supposed to connect the middle front green lane to the left yellow lane). Since these interconnects are joined to the main lanes sideways in the dimension of the planar rails, you simply steer as you would in 3D to get on the interconnecting ramps, and the planar rails will guide your vehicle to the right place. Now, even though I designated the pavement with two cuboidal sheets, you can see that there's plenty of room left over between the lanes in the road. Presumeably the city landscaping committee would grow some grass and trees here to improve city scenery, and you can easily build paths between the two pavements to allow pedestrians to walk between them. At no time do you ever need to cross the road (in the sense of stepping onto the road surface). You just walk "around" the lanes like you'd walk around telephone poles in 3D. Neat, huh? Note that for the same of clarity, I've reduced the number of lanes to 3 and made each lane rather narrow so that there's ample space between them for us poor 3Der's to see what's going on with the road structure. Conceivably, in actual practice lanes would be wider and closer together to reduce wasted space (though the landscaping committee might object to that ). Originally, I had 5 lanes going between the two buildings in each layer, making a total of 15 lanes. That's pretty high throughput for something that easily fits between two buildings! Even with the reduced number of lanes as shown here, we have 9 lanes in total. That's still a lot of lanes. So something like this would be perfect for busy city centers, where you can maximize the use of space between buildings and allow large volumes of traffic to pass through easily. If you look at the image I posted, you can see each lane is a long and narrow strip. You can regard the front and back sides of the strip as a pair of plates (i.e. the planar rails), where each strip is a pair of planar rails. They are planar but don't have to stretch indefinitely in both dimensions except at junctions with the interconnects. If you place 4 wheels on each of these plates (total 8 wheels), then your vehicle will be stable and won't fall over. Of course, the way I depicted it here is probably a bit too narrow, but if you push the planar rails apart somewhat, then the vehicle will be stable. The wheels never have to leave the rails even when navigating a junction, since there's a pair of continuous surfaces branching off from the main rails, even though you can freely turn left/right. Again, this is a top-down projection of the system, so we're looking at the "overhead" view of the 4D vehicle. The two gray plates are, obviously, the planar rails. 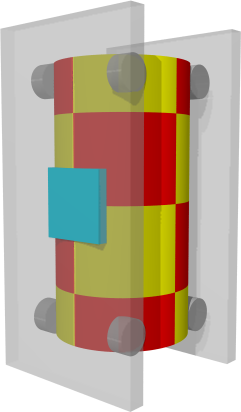 The checkerboard cylinder represents the (projection of) the vehicle. As you can see, the 8 wheels are more than enough to hold the vehicle in place. There's no danger of falling over. The blue square on the side represents where the door would be. Note that it overlies where the planar rails are, because that's where the vehicle can't turn into (it's the "safe" dimension), whereas the region between the planar rails are where the vehicle can turn. So passengers would step over the rail to get on/off the vehicle, just like you would with 3D trains. I didn't illustrate how the wheels would turn, but it should be clear that if the top 4 wheels were to rotate clockwise/counterclockwise along the axis perpendicular to the rails, the vehicle would turn to the left or right, while still being confined between the rails (if you imagine the rails extending left/right indefinitely). Thanks quickfur, I like the picture. Just a few questions to help me. Where are we looking top down from?